The San Francisco 49ers’ brass recently turned to the University of Oregon for high-end talent along the defensive line with first-round picks in back-to-back drafts, selecting Arik Armstead (2015) and DeForest Buckner (2016). And while Buckner has earned an impressive 82.3 overall grade and a top-10 pass-rush grade (79.1) in his three years in the league, Armstead fell off a bit after a strong rookie campaign (78.3 overall grade; 2015). Armstead, however, has returned to his previously dominant form in 2018, especially considering his play in recent weeks. The former Duck product has earned game grades above 65.0 nine of his previous 10 games with San Francisco, all combining for the seventh-ranked overall grade (87.1) among the 82 edge defenders with 250-plus defensive snaps in Weeks 4-14. Furthermore, across his 138 defensive snaps in Weeks 10-14 (four games), Armstead has earned the sixth-highest overall grade (88.3) among qualifiers. Though he ranks outside the top-15 in PFF’s run-stop percentage at 8.8% on the year, Armstead makes his presence felt as a frequent flyer to all of his opponents’ backfields. He has been the first to contact the ball carrier on 13.49% of his run-defense snaps in 2018, ranking second behind only Jacksonville Jaguars’ Calais Campbell (16.73%). And Armstead’s pass-rush ability, though it pales in comparison to his run defense, isn’t too much of a liability. Since Week 4, Armstead has earned pass-rush grades above 65.0 in seven of 10 games and recorded 25 pressures in the process. His pressure percentage (14.6) and pass-rush grade (76.4) ranked eighth and 16th, respectively, among the 79 edge defenders with 150 pass-rush snaps in the 11-week span. What has been a liability in 2018, however, is Armstead’s tackling ability. He’s missed a career-high seven tackles through Week 14 and owns a dismal 51.9 tackling grades, the latter of which dragging down what would be an even higher overall grade if he could sure up that part of his game. 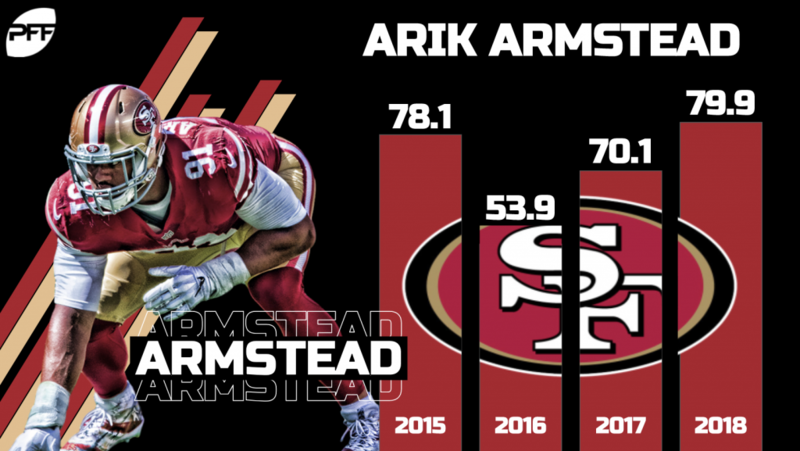 Armstead is on pace for a career year in 2018, a testament to his constant improvement and dedication in recent years. And he’s just scratching the surface, as he’s just a few better tackling attempts and a further improved pass-rush from truly elite play.